This is the sad situation that had grown on my sewing table. A teeny little drawer overflowing with needles, needles, needles. I decided to use some leftover scraps of contact paper from last month’s chalkboard project to do something about it. 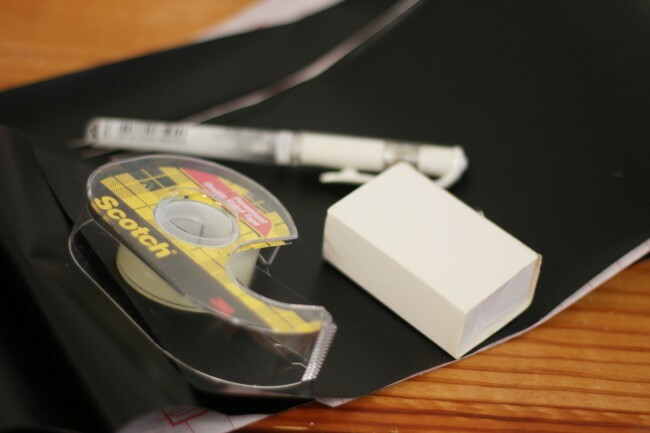 In addition to the black contact paper, I used a white paint pen, some slide boxes, and permanent double sided tape. The rest is easy to figure out. I took seven boxes and covered them in contact paper. I decided to group the needles into seven boxes for the different sizes and functions: delicate, light, medium, semi-heavy, heavy, knits, and specialty (which is sort of my “misc” category, including things like wing needles, topstitching, etc). I also wrote the needle sizes on each. Now I don’t have to think about what needle to use with what fabric. You could get more specific, of course. You could include examples of each type of fabric, use more boxes for various needle types, etc. I thought this would work for me, though. I then stuck them on the wall with double-sided tape. The tape is strong, but I don’t think it’s strong enough to hold them permanently, so I’m going to replace it with those little velcro dots. To get a needle, I simply push and slide the box open, easy-peasy. 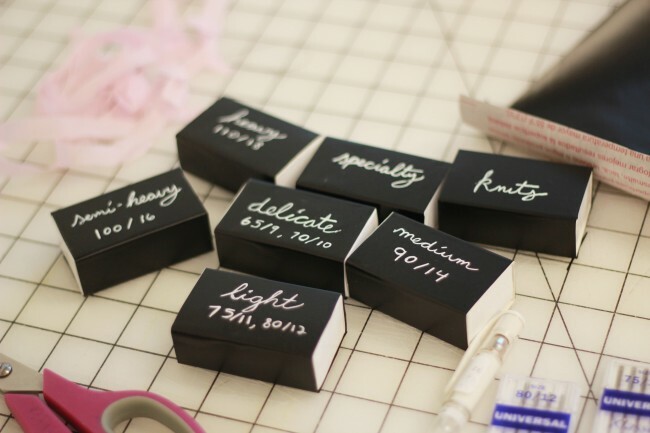 I bought my slide boxes in bulk from Paper Mart, but you can find smaller quantities on Etsy, like these. You may want to measure your needles first to see if they’ll fit, since different brands are different sizes. Or you could use all kinds of recycled boxes or tins, or even make your own boxes. Want to test sew a pattern? Giveaway: Win a Pattern + Gorgeous Modern Fabric from The Needle Shop! Any pics of your needle storage to share please :)? also do you have anywhere (or can you share) a guide to what needle to use for what type of fabric? i am never sure and think i normally use one that is too big. My book has a handy little chart (had to plug it! ), but I plan to make one for the blog soon as it’s surprisingly hard to find! Sew Mama Sew has a terrific post on needles that goes into a lot of detail on the matter! thank you – i have the book but missed the chart! and now that i can see the pics, it makes it much clearer! I LOVE this!! What a great idea and it looks darling. My needles are a mess – in fact, my whole sewing area is a mess – and this is a good place to start. Thanks for sharing. Brilliant! I tried to pin this post, but there are no images. The strange thing is: the images showed up when I first read the post in my Google Reader! The internet can be so strange sometimes! The pictures show up on Chrome, though not Explorer. But they do look great on Chrome! I use a plastic multi section business card holder bought at Office Max. The slots are perfectly sized for the needle cases. I use my labeler to identify which needle is which. I didn’t come up with this idea but it really works well for me !! I’m receiving the pictures just fine on Safari and mobile safari (for iPhones & iPads). Also, I was able to pin it just fine. I put it under the magnet strips for now, but might move it. I know, I really need to take pictures of the whole space but it’s always a mess when I think of it! I’m in a sewing frenzy this week and it looks like a tornado blew through at the moment. No problem! I’m loving this series of organizing buttons, scissors, knives by the way. The button idea was genius! Sewists have so many supplies, it could go on forever! Fabric, thread, scraps, patterns, zippers, lace embellishments… Definitely serious organization overload! Hey guys, there was a bug that made these images unavailable in some browsers, but it should be fixed now! I use a plastic box — the kind that can also be used to organize embroidery floss — to organize my needles. It also works great but does take up some valuable table space. I’m thinking about getting something like that for my presser feet. They’ve really outgrown their teeny cabinet that came with my machine. I also keep my presser feet in the same floss organizer as the needles as well as the buttonhole cutter and its wooden base. It works great! 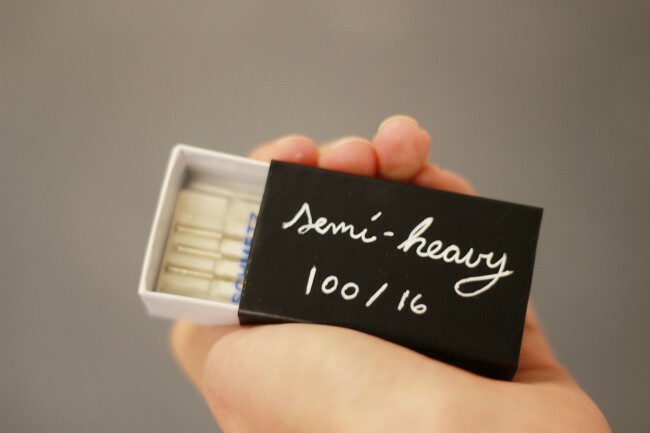 Storing needles in a visually appealing way…that has got to be one of my challenges for the new year. I tend to buy so many on sale at Jo-Ann or Hancock’s Fabrics (and so should you – I cannot tell you how often a needle has broken mid-project, I look for a replacement. There is none. Naturally, now this happens at midnight when stores are closed. Then I have to stop sewing and I go to bed in a foul mood, ruining my dreams for that evening. I just have nightmares about teeth (or hair) falling out…all prompted by the fact I didn’t buy enough needles at last month’s sale. So, let this be a lesson to you – if you want to sleep well at night (and who doesn’t? ), be well-stocked on all sewing supplies so you can go to bed happy and have wonderful dreams! Excellent idea and so cute to boot! Such a great idea! I need to get my needles under control. I keep them in a little plastic pencil case and they always slip out of the snap cases they come in and then get all mixed up and it is a complete disaster. Looking at the pictures, it just dawned on me how rare it is to come across matchboxes anymore. You are on a roll with all this organizing! You’re inspiring me to get my act together and clean up! I labeled mine with a small piece of tape with a label-maker. I keep the appropriate tube out so I can remember which needle is in the machine. Sewing machine needles can fit in the small 2 1/2 inch size. What a cute idea. I love your lettering! Do you have any problems with the needles falling out when you slide the box open? Not at all. You’d have to slide the box almost all the way apart for them to fall out on their own. so simple but makes so much sense! Good Heavens…You are totally changing my world about organizing my sewing stuff! Last week’s Ikea info and this week’s boxes! I just wish that Ikea would do more shipping from their site for little things. It’s such a hike for me to get over there (I’m in Beaverton) and apparently magnetic knife blocks are like $20-30 at the other stores (being the uh, frugal, woman I am I’m loathe to pay that much!). Anyway, thanks for all the good ideas! I wonder it is worth mentioning on your blog, or maybe you already have, about the need to change sewing machine needles more frequently…depending on use. I was surprised that a friend of mine who sews up a storm complained that she had problems with her machine and when it was mentioned to her “have you changed your needle?” that took care of the problem. It’s easy for a needle to get bent out of shape. If I quilt I need to change it after one quilt project. Otherwise I can sew up quite a few clothing items before changing it, of course the type of fabric depends on size/type of needle as well. You probably could use empty match boxes as well. I love this idea! I will probably add little magnets to the back of each one and stick them to my metal filing cabinet next to my sewing area. You are very clever!!! I absolutely love your idea for your slide boxes. Not only do they look great, but they really serve a purpose. The black and white look is also very attractive. Thanks so much for this tip! Genius! I already had my scissors stored on an Ikea magnet strip before you posted it the other day, but THIS I had never even thought of! Fantastic! what great idea, thanks!! have to keep it mind…my machine drawer looks similar to yours :).. 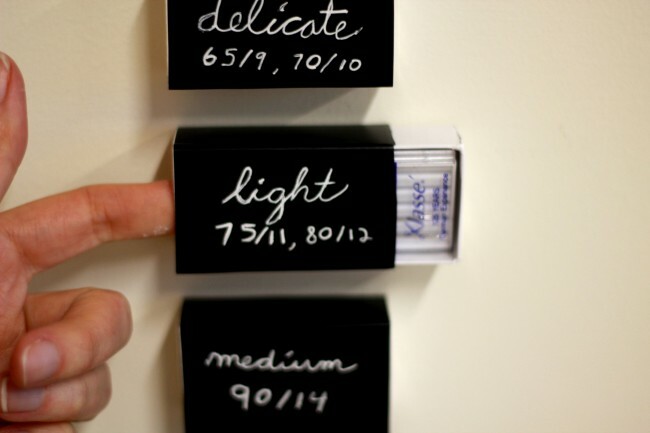 This is one of the best organizing tips I have seen in a long time. I often have to check the package to remind me what type of needle I need, with this tip I can organize the needles and start to remember what size will work with what fabric. As someone else posted, I think old match box’s will work great for this project. Thanks so much you have just changes my life!!! 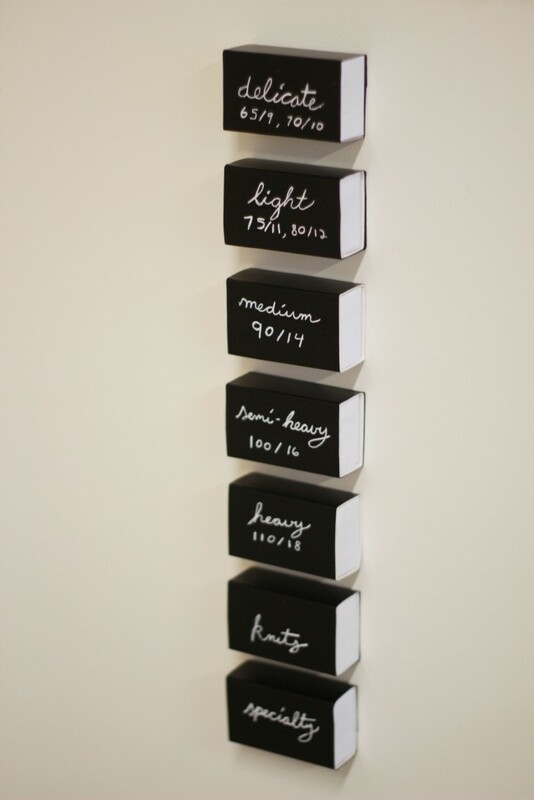 I just love all of these creative ideas on storage. This is brilliant. I am forever buying new needles as I have no idea what size of kind of needle is floating around in my sewing box. I have a lot of needles which I just take a punt on most of the time. If I am sewing with stretch and need a ball point needle I will pop in a needle sew on a scrap piece and if it doesn’t skip stitches I assume it’s ball point!! This will save so much time for me. 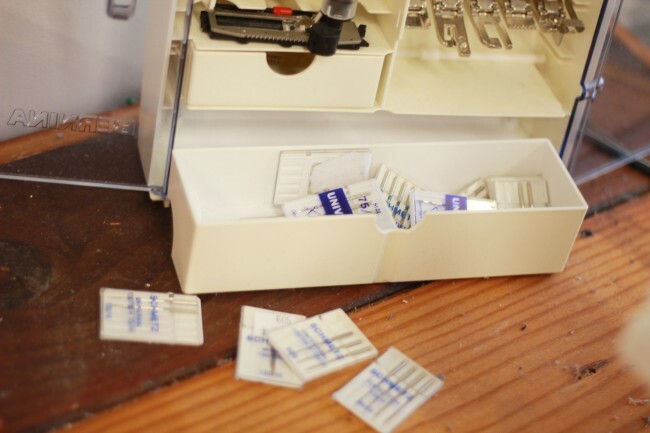 Do you have any tips on how to get the tension right on your overlocker? LOVE this idea! I’ll definately be using something like this! thank you soooooo much….i have been trying to think of a way to organize my needles…..i can’t always see the size on them after they are opened and end up using new ones when not necessary just because i can’t tell what size they are! this will help a ton!!! I Love your organizational tips!